A very powerful and efficient tool was integrated by Microsoft named Detect and Repair in MS Office XP, Office 2003 and 2007. This helps you to fix the corrupted documents, files of MS Office. You can also recover the PowerPoint file, .xls file, .doc file and .mbd file. But the tool will repair is totally depends upon the Office application from where the tool is installed. It is described well with the help of an example; if you need to fix the corrupted MS Access database then you requires launching the tool from within MS Access. In this blog you are guided the procedure of accessing and using the Detect and Repair tool for repairing the corrupted Access database file. This tool detects the Access database files presented for searching and repair the corruption in the files. It scans automatically and fixes the entire available database files. What’s This Microsoft Detect and Repair Tool is? 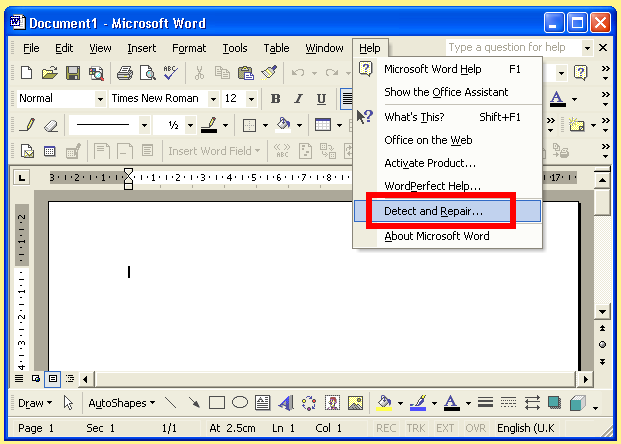 Microsoft has included a new tool which is named as Detect and Repair tool in MS Office 2003, XP and in Office 2007. With the help of this tool, one can easily repair the damaged documents in MS Office. With this tool, one can easily repair the .ppt file, doc file, .xls file and .mdb file. However, the tool will fix the issues that depend on Office application from where you have launched this tool. As for instance, if you want to fix MS Access database corruption then you should launch Detect and Repair Tool within MS Access. However here you will to know about the process of accessing along with using the repair tool to solve the Access database file. This tool easily analyzes the entire access database files that are available for finding and repairing all the possible corruption issues in the files. It scans the entire database automatically and also repairs the database files that are available. Step 2: Click on the MS Access and the PowerPoint buttons. Step 3: Choose the Resources Tab. Step 4: And click the Diagnose button. After launching the tool use the MS Access application and follow the onscreen instructions for using the tool. What To Do When Detect And Repair Tool Won’t Work To Repair The Corrupt Access Database File? However, if the Detect and Repair tool does not able to fix the corrupted Access database file, or in case you are finding difficulty after running the Detect and Repair tool to work with an existing Access database file, then it is recommended to make use of the third party software. MS Access Repair and Recovery software helps you to repair and recover any damaged, corrupted or inaccessible database file. This tool helps you to fix any type of MS Access error. It not only repair the errors but also repairs the .mbd and .acccdb files and recover the corrupted data from your MS Access database. You can easily recover the corrupted indexes, relation, queries, tables, modules, password protected forms etc too. This software will work on all version of Windows operating system like Windows 95/98/ME/NT/2000/2003/Vista/7/8/8.1. Step 1: Download and install the software and select the corrupted Access database for repairing. Step 2: The software will give you the list of all searched files in a drive. Select the file you want to repair and click on “Repair” button. Step 3: The recovering process is get started and you see the log report for analysis. Step 4: Once the recovering process is get over, click on “OK” button to see the preview of the file database objects. Step 5: You can now preview the repaired file. Step 6: By default, the software will save the repaired database to the location where the corrupted database was saved but with the new name. You can also select the desired location to save repaired database. Step 7: Your saving is in process.